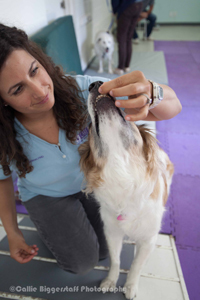 CARE’s veterinarians and physical therapists, all certified in canine rehabilitation, create and customize a comprehensive home exercise program for each pet. The home exercise plan is a very important part of success and it is tailored specifically for your pet’s needs and goals. The plan will change as your pet progresses and will be continuously updated by your CARE doctor and posted to our exclusive website – Flexible Pet – which you can conveniently access from home. We will teach you how to best perform each exercise, so that you can help to eliminate your pet’s pain and help your pet become more mobile at home. Allow your pet to stand on a supportive, non-slippery surface. Use a toy or treat to encourage your pet to look under their body and between their legs in order to grab the toy or treat with their mouth. Move the treat farther under their belly to encourage more neck and trunk range of motion (flexion or arching). Do not allow your pet to step or walk to get the treat. This exercise will improve your pet’s weight bearing ability and trunk flexibility. With your pet on a non-slippery surface take a treat and hold it above your pet asking them to look up for the treat. This will improve your pet’s neck motion as well as shift their weight over their back legs. With your pet standing, have them reach for a treat while stretching towards the shoulders, ribs and hips. Each stretch should be performed separately. Do not let your pet step aside or walk in a circle to get the treat. Your pet will soon learn the trick and have fun finding the treats, while gaining flexibility and core strength. This exercise is best performed with your pet lying on their side; it is also acceptable at a stand. Hold your pet’s thigh with one hand and lower the leg with the other hand. Then gently and slowly bend the knee into flexion; next, extend the knee into a straight position. Stop and hold movement when your pet withdraws the limb, tenses muscle, increases breathing or changes body language as it may be an indication of pain. Gently assist your pet to lie on their side. If they will not lie down, you can perform the range of motion exercises while your pet stands. Use one hand to stabilize the end of the limb and to keep the limb parallel to the ground. Hold your pet’s thigh with the other hand. Keep both hands close to the hip joint; if your hands are too far away from the joint, you might injure your pet by applying too much force. Gently and slowly apply pressure using the hand holding the hip, opening up the hip joint into extension. 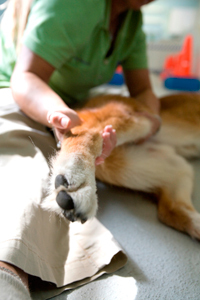 Stop and hold when your pet exhibits one of these signs: withdrawal of the limb from pain, perceptible tightness with movement, or a tensing of the muscles. Stop range of motion exercises if they cause your pet pain. CARE professionals are the creators of the first and only internet-based home exercise program for pets called Flexible Pet. It has instructions, photos and instructional videos about how to conduct your pet’s therapy from home. 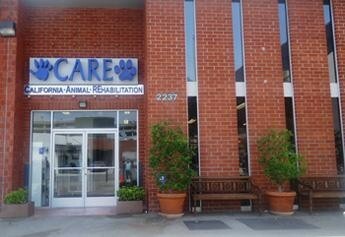 It also is a medium for communicating with your rehabilitation professionals and is constantly updated as your pet progresses through therapy. Information about treatment and exercises is general in nature and does not cover all possible injuries or outcomes. This information is not intended as medical advice for individual problems or as an evaluation with regard to the risks of any treatment. These exercises may contain only a portion of information relevant to your pet’s circumstances and are simply examples of exercises used as a part of a custom and comprehensive home exercise program created by a veterinarian certified in canine rehabilitation. Use of any treatment or advice is solely at the user’s own risk.